A beautiful gift to your gorgeous mom will make her day. So go for a perfect gift like flowers N Cakes from MyFlowerTree with just one click. Your mom will definitely love this surprise as our cakes are extremely delicious and mouth –melting and flowers here are garden-fresh and naturally fragranced. So place your order for an adorable mother’s day gift. 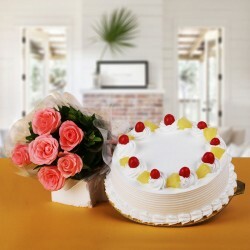 On Mother’s Day special, you can send Flowers N Cakes online to your mom and make her feel special. Your Mom knows everything since your birth till date and to make her feel happier is indeed your deed. So choose some of the fresh flowers from MyFlowerTree along with tasty, scrumptious and completely delectable cakes online. So go for Flowers N Cakes for Mother’s Day celebration. At MFT, you get completely delectable cakes available in different flavors, size and shapes. Along with this, you can go for fresh bunch of flowers. So why wait? Go for celebrating Mother’s day special with our assorted flowers and cakes. You can choose this combo at our platform like assorted roses and black forest cake, mixed roses and butter scotch cake, red roses and chocolate cake for mom, blush and chocolate cake, splendid token of love, basket of elegance, affectionate potpourri, beauty in red, soft and creamy combo, symbol of adoration, etc. This special combo is an ultimate gift for a perfect Mother’s Day celebration. Our special Mother’s Day Flowers and Cake are available in a wide range that you can explore for your grand celebration. Be it your Mom your grand mom or mother-in-law, you can send them stunning flowers and cakes whenever you want. We deliver elegant collection of flowers and cakes on the same day, at late night or even at early morning and via our express delivery. You can approach as per your needs and requirement. Feel free; to connect with us whenever you want, we are always happy to help you.